I've seen quite a few vintage lace collars floating around Etsy. I think that they are lovely (see this, this, and this). I don't typically decorate my home with crocheted doilies and lace, but I love the idea of decorating oneself with it. Start with an unwanted doily, mine was about 10 inches in diameter. Cut up one side of the doily to the center. 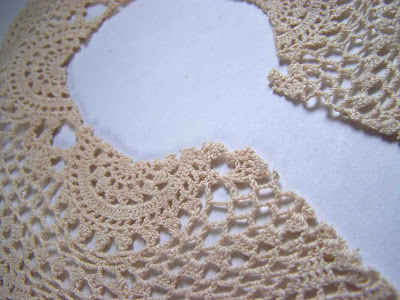 I ended up rounding off these two sides, because I thought that it looked better with the scalloped edges. Cut a hole that is large enough for your neck. You are most likely going to be wearing it at the base of your neck, so measure at the widest point. Once you've cut an initial round, you can adjust it as needed. Finish off your raw edges. Initially I had thought to use a thin double fold bias tape for this step, but then my sewing machine quit on me, and I was then forced to use the rolled hem function on my overcast serger. It worked quite nicely, I only wish that my thread was a better match. If you wanted you could hand stitch the rolled hem so that it is turned to the underside of the collar. You could also sew a thin velvet ribbon along the rolled hem to make it a bit more polished (I'm going to have to wait for my replacement machine to show up before I tackle that). To finish it up I attached a "pearl" from a broken bracelet. 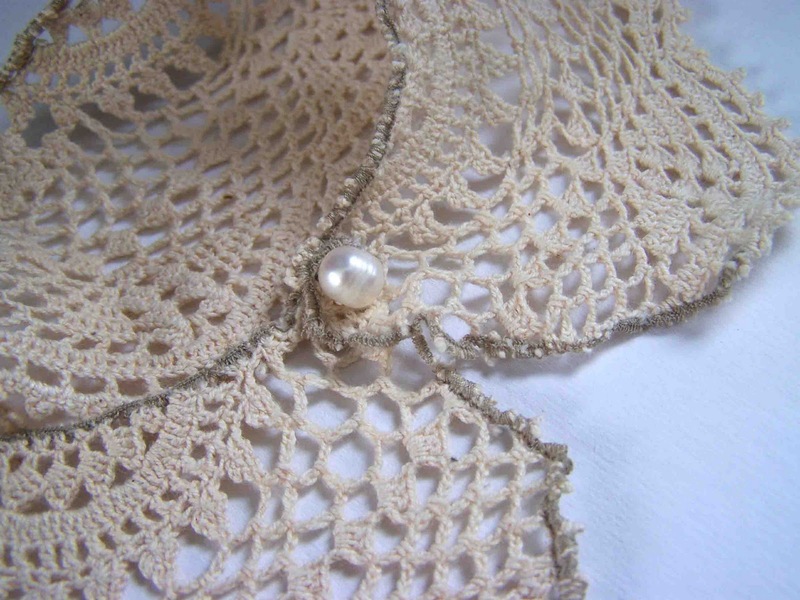 The collar is fastened by slipping the pearl through one of the holes in the lace. That's it. 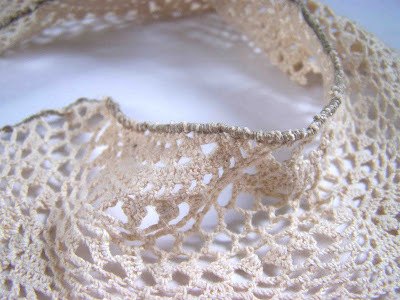 A super simple and easy way to turn a household doily into a lace collar. Pretty! What a great idea! 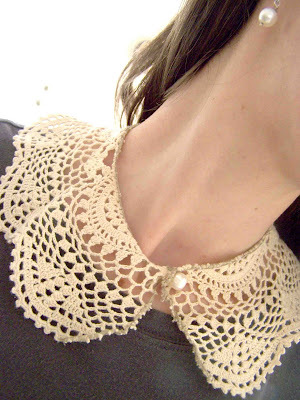 I have a vintage dress my grandmother sewed and the lace collar is a bit yellowy. I should try this after I seriously improve my sewing skills. . . . I don't want to mess up the lovely dress she made! Hope your machine is okay. A great idea, looks nice! This is so pretty!! A great way to add a vintage look to a plain tee or sweater without permanently altering it. 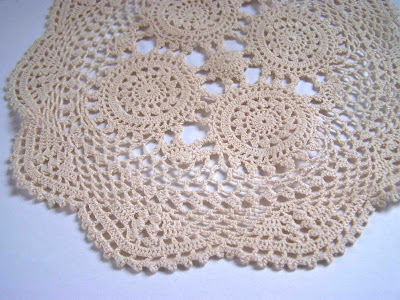 Okay, I'm not a big doily person but I think this is great! I think it would be great addition underneath the collar of a collared shirt, too, for just a touch of laceyness. 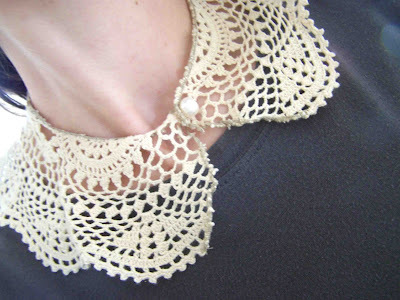 Thank you so much for sharing the tutorial, I can't believe I haven't thought of this myself, I love doilies and collars too!! This would be really sweet on the right little girl dress or top too! Thanks for this great idea! 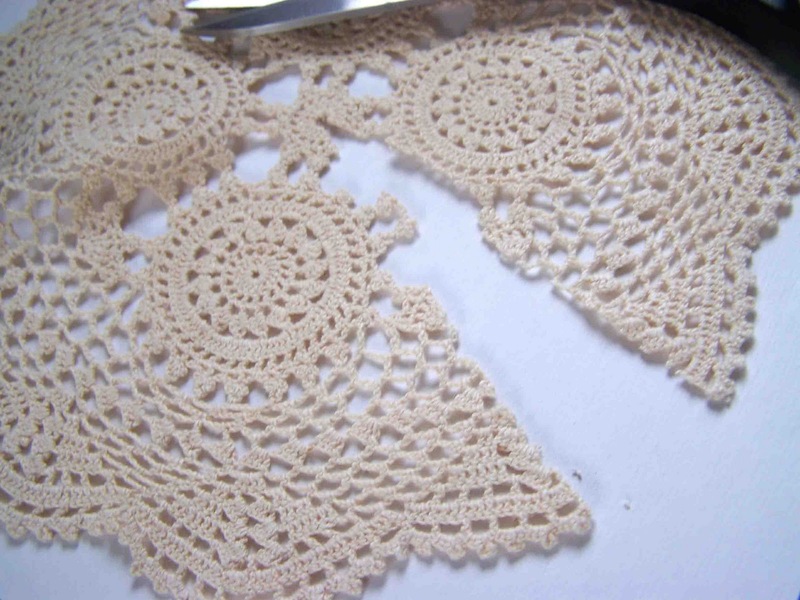 I just received a ton of doilies and such from my great grandma's collection of stuff and had no idea what I was going to do with them other than perhaps place tea cups on them and have a tea party. This seems like a much more practical idea! Thank you!